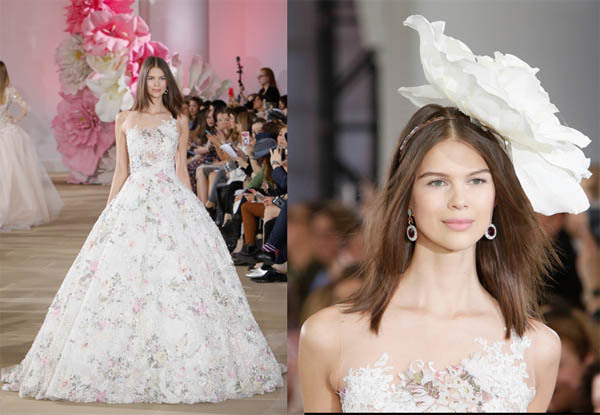 Posts Tagged "Big Beautiful Bridal Rose"
Home » Posts Tagged "Big Beautiful Bridal Rose"
Love the bigger than big beautiful white rose perched prettily to one side of the head of this beautiful bride from the Ines Di Santo Couture Bridal Collection for Spring/Summer 2017, shown yesterday, but an idea which can inspire for brides now. The simple, straight, mid-parted glossy, glowing blow-dried, flat-ironed hair by Felix Fischer for Pai-Shau was achieved with the help of a cocktail of products, always key, and will look as good the morning after the wedding as on the wedding day (not always the case!) The designer “pulled from Spring herself, imagining flowers that emerge in the season and the path they take from seed to sunlight” – using lace and embroideries on gorgeous gowns with movements, all soft and romantic.